Know a girl who is a pioneer? Someone who likes to break new ground, shatter expectations, and be involved in historic moments? Girls aged 11 to 17 will be welcome in Scouts BSA in February 2019! Christ United Methodist Church is standing up an all-girls troop alongside Boy Scout Troop 441 in Sugar Land. It’s a one-stop shop for your whole family. All of your kids can be in the same place at the same time. If fun, adventure, leadership, and friendship would interest a girl in your life, please join us on Wednesday, November 13, 2018, at 6:30 PM to learn more. Year-round meetings will be weekly on Mondays at 7:00 PM beginning February 4, 2019. 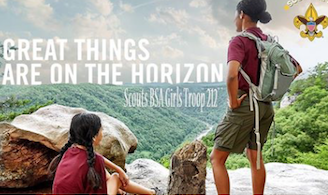 The troop will camp once per month, including a weeklong summer camp and multiple high adventure opportunities (e.g., trekking, canoeing, scuba diving, sailing, hiking, etc.) per year for older Scouts (13/14+). Service hours for school? We do all of them and more, conservation projects in local parks, and collecting food for the disadvantaged. Scouting builds character, leadership skills, and a deep sense of citizenship. Scouts learn lifelong skills that enrich executive functioning in middle and high school and help them to make better choices later in life. Most importantly, Scouting creates a safe space for kids to push themselves beyond their own (and your) expectations.